Digital creative technologies have penetrated every aspect of the museum experience and have, greatly enhanced the visual effect of museum exhibitions while usefully promoting the interactive relationship between audiences and the exhibition environment. This paper aims to identify issues which affect the uptake of digital technologies in decorative arts collections in two museum sites: Nanjing Museum, Jiangsu Province and the Museum of Applied Arts and Sciences, Sydney. It explores the ways in which digital and physical spaces are established for both discovery and interaction. The paper is informed by the belief that the nature of digital museum exhibition is to help visitors get sense of identity and pride of national culture through experience and reflection rather than to remember advanced digital technology. With the ever-accelerated development of social economies, ideology, science and technology, contemporary museum exhibition design demands a greater balance of technological innovation on one hand and the spiritual pursuit of art and culture on the other. It is well known that digital creative technologies have penetrated every aspect of the museum experience and have, greatly enhanced the visual effect of museum exhibitions while usefully promoting the interactive relationship between audiences and the exhibition environment. But if digital techniques are merely presented visually, audiences are may not impressed with the collections even if they can use mobile devices to record interesting lighting effects. Instead, digital techniques can be perceived in the form of tactility or sense of smell to help audiences participate in the interaction with collections to get better and more reasonable visiting experiences. Therefore, digital creativity should be used to establish two kind of environments in museums: one is for groups’ visiting experience; and another one is for individuals’ application. For groups, we can use digital techniques to set up the outline information of collections in a short time; while for individuals, certain relevant digital exhibition devices can be utilized to make them get data information of collections independently. Digital creativity in Australia’s museums has many years of development. Recent research (Alex, 2009) has shown that over the two centuries since European settlement, Australia has developed fine archives, libraries and museums which are guided by strong curatorial professions. Globally linked and technologically proficient, their standards conform to international models of good practice and sometimes lead the way. Specialist museum and galleries abound including the Powerhouse Museum in Sydney which was developed from the Museum of Arts and Sciences and has rich technological collections. Many have taken advantage of new technologies to engage visitors and stimulate understanding interactively including the South Australian Museum presentation of Indigenous culture and technology. The Questacon, located in Canberra, is Australia’s National Science & Technology Center which promotes interest in science, especially by children, through quirky and exciting exhibits and the use of young explainers who take touring exhibitions and outreach programs across Australia. In recent years, and increasing number of museums in China have come to realize the importance of digital exhibitions. For instance, The Palace Museum, Beijing in partnership with IBM, has launched a 3D vision guide for visitors. Visitors can browse the virtual palace by clicking the mouse, and can create avatars and interact in a virtual environment. Currently, the Digital Gallery of Nanjing Museum is the most representative system of domestic digital exhibition technology. 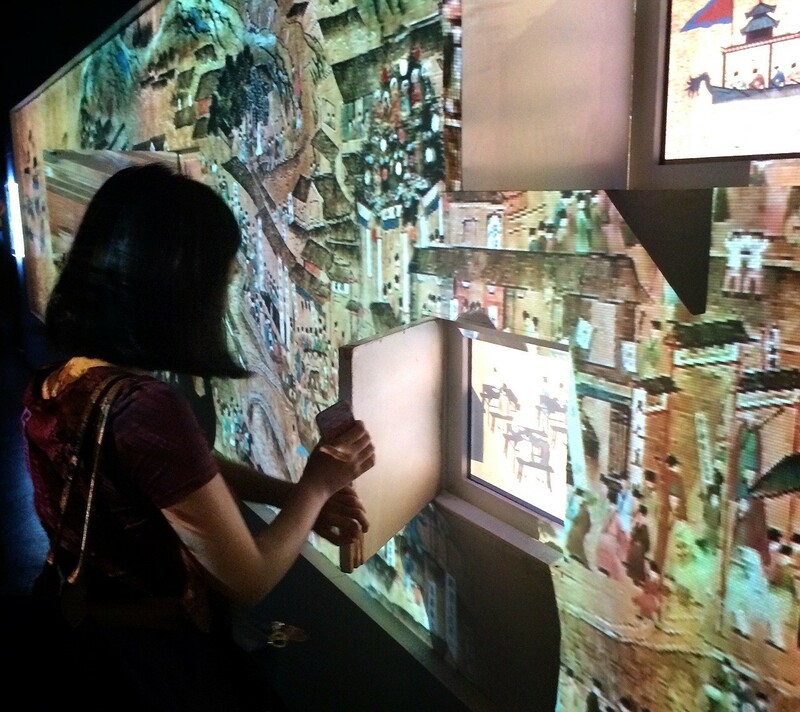 It includes physical and online virtual exhibition rooms, the physical one showcasing ancient Chinese civilization, especially Jiangsu’s civilization. The exhibition offers sophisticated digitally enhanced environments which deliver experiences based on physical interactions with the space while the virtual environment is a permanent online object collection. This paper aims to identify issues that affect the uptake of digital technologies in decorative arts collections in two museum sites: Nanjing Museum, Jiangsu Province and the Museum of Applied Arts and Sciences, Sydney. It explores the ways in which digital and physical spaces are established for both discovery and interaction. Towards comparative methods, this paper analyzes different digital ideas arising from the influence of two different cultures and interprets similarities of cross-cultural technical highlights attract audiences to get better visiting experiences. This paper is informed by the belief that the nature of digital museum exhibitions is to help visitors get a sense of identity and pride in national culture through experience and reflection rather than through advanced digital technology. The Powerhouse Museum is a major branch of the Museum of Applied Arts and Sciences in Sydney, the other being the historic Sydney Observatory. Although often described as a science museum, it has a diverse collection encompassing all sorts of technology including decorative arts, science, communication, transport, costume, furniture, media, computer technology, space technology and steam engines (Wikis). Although light is an insubstantial medium, it has an enormous impact on our perception of physical spaces as well as the emotional response of those who study, work, play or shop in these environments. In museum exhibitions, good lighting design may inspire ingenuity while defining, accentuating and enriching our visiting experiences. 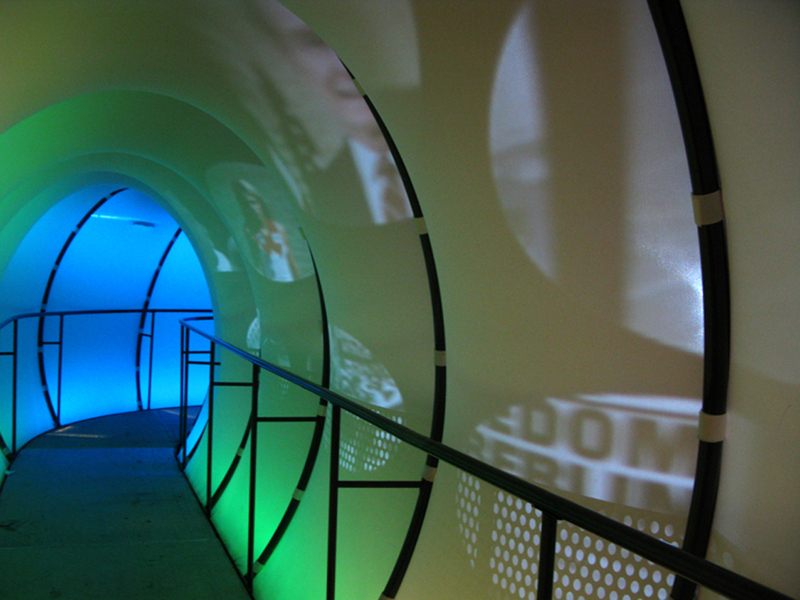 Seamlessly transforming concepts into detailed technical specifications requires a skilled balance of many key components (http://www.smadesign.org/lighting-design.html). The aim of traditional lighting design in museum exhibition is to attract visitors into the exhibition, but this approach is antiquated in the digital age. Nowadays, lighting design for museum exhibitions has been changed to be more digitized, dynamic and be full of variation. To reveal the stories and meaning behind each collection, the lighting design of Powerhouse Museum tends to use dramatic ideas matching the relevant exhibition themes. Collections are placed in a particular exhibition scenario with music and story-driven atmosphere in order to help visitors understand and recognize the values and life-style belonging to the theme. For instance, in 2011, a temporary exhibition called THE 80s ARE BACK was shown successfully. The curator took advantage of structured lighting design technology to take visitors back to the music, fashion, parties, politics and the people to find out what were the 80s really like.With the digital changing color of the arched gallery at the entrance continuously showing celebrities and photographs of the 80’s, it surpassed the basic lighting function of design and seemed like a time tunnel which lead us to take a journey through time and space. 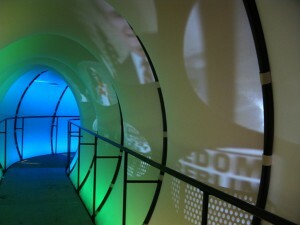 The focal glow and ambient luminescence were also fully applied in the main exhibition area. 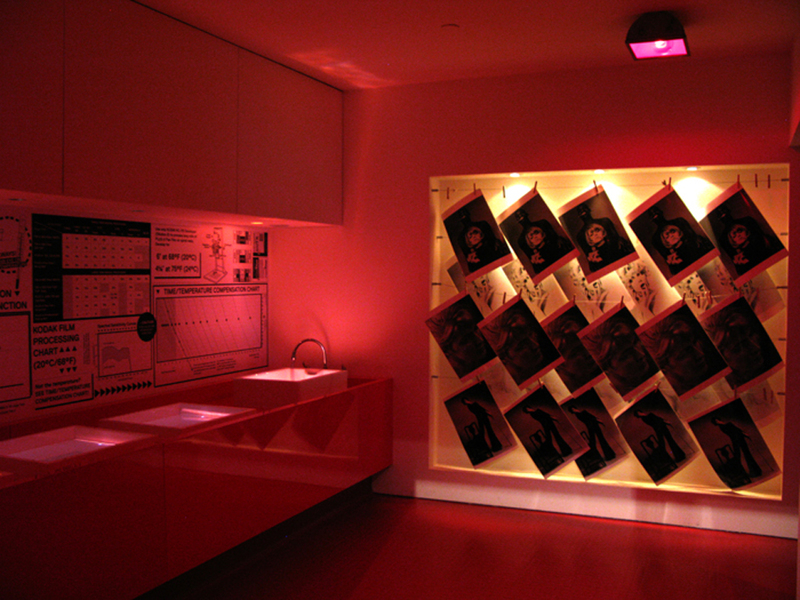 Visitors also have time for free activities under the standard lighting to stop to stare at a certain object under the scope of focal glow, which emphasizes key visual information. In particular, it was very interesting for experiencing a device space that is a dark room used for developing photographs. Anyone can take a hands-on approach to developing black-and-white photos with counting the time of photographic developing and fixing in this imitative space of the 80’s. The exhibition lighting effect is determined by the plasticity of light; while the new lighting design based on the digital technology portrays the existence mode of light from static to dynamic state. For this reason, the expressiveness and artistic creativity of light are continuously being developed to serve for the plot of museum exhibitions as well as for the remarkable visiting experience. 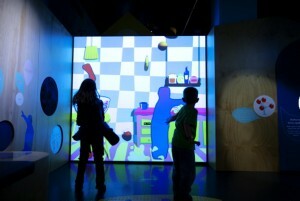 The Wiggles Exhibition is a superb representation of gesture-based interaction. Having studied early childhood education, the Wiggles structure their performances around how young children develop and learn. The exhibition is carefully curated so that adults are as well entertained as children. While children dive into free-form or are engrossed with high-tech interactive exhibits, grown-ups will uncover the amazing rise of the Wiggles and what’s kept them strong for so long. The gesture-based interaction plays a key role in harmonious human-computer interface environment. With the rapidly development of digital creativity, traditional human-computer interaction mode for museum exhibitions has failed to keep up with demand of visitors. In recent years, more friendly and intelligently human-computer interface in view of vision and audition has been sustainable developed. The development and use of interactively within the computer gaming industry has been more expansive an revolutionary and has been a much greater driver of the expectation of using digital technology to both play and learn (Nik and Paul, 2009). During the Wiggles Exhibition, for visitors, especially for children, huge interactive screens lead them to use gestures with wagging motions to interact in some digital games by completing tasks without touching with the screen. Besides, some other digital interactive screens need visitors to touch the screen with fingers to paint and fill colors. The characters, animals or vehicles on the screens will change from static to dynamic state after you finished the paint. It can be seen that touch screens has tended to be a preferred input device for interactives because they provide an intuitive interaction for the user and therefore require a very short learning curve to teach the user how to control the experience (Nik and Paul, 2009). As a kind of natural pattern of interacting with virtual images, the structure of human gesture is similar to the natural language; while the recognition of gesture is similar to language interpretation. With the use of digital creativity, human gesture is constantly integrated with the virtual interactive environment to create increasingly proximity, efficiency and interest. Offering learn-by-making workshops in applied arts and sciences, Thinkspace is a digital learning center of the Powerhouse Museum. There are a variety of practice projects for children, young students and adults, including teachers and professionals; and even for disabled people. Guided by experts, Thinkspace learning experiences are engaging, interactive and 100% hands-on (https://maas.museum/learn/thinkspace/). In the workshops of Thinkspace, there are a lot of different programs or courses for digital creativity learning. Adults can learn how to design interactive games while children can be taught to make claymation with a tablet or phone. There skills directly translate to allow people to be creative at home and continue to make stop motion movies together. It is worth mentioning that a certain mobile APP called Thinkspace AR which is created by young people participating in creative digital media workshops at the Museum’s Thinkspace. It is not really a game but a Mine-craft themed augmented reality gallery. Displaying 3D Mine-craft objects in augmented reality, it explores and manipulates objects. Beyond its curiosity value, the discovery of unknown 3D world could have practical benefits for the museum. The museum also provides some special workshops for disabled people. A variety of electronic and acoustic musical instruments can be used by participants to create live musical jams and sing-alongs as well as explore popular songs and music styles from jazz and classical, to rock and dance. Electronic instruments used include keyboards and drum pads, “Jelly-bean” buttons and switches, touch sensitive devices including iPads, and the Special Access Kit “banana” keyboard — an ergonomically designed MIDI-interface designed to suit a wide range of physical abilities. Traditional instruments include a wide range of hand-percussion, and stringed instruments such as electric guitar and a digital drum kit (https://maas.museum/learn/thinkspace/for-people-with-a-disability/). Relics are the results of human behavior as each one artifact created by humans is to achieve a certain purpose. Human history is constituted by a series of relevant human behavior and human behavior is controlled by the emotion. From this perspective, museums should not be conservative, but should be more open, inclusive and vibrant. Also, as a kind of public cultural and educational institution, museums should be at the service of all-around development of the public. The digital gallery of Nanjing Museum is built up based on this objective, records visitors’ behavior and emotion; and communicates with public sentiment. The digital gallery is a combination of real space and virtual space. Real space displays heritages of Jiangsu Province by means of digital creativity; while with the help of network, the virtual space provides opportunities for the public to explore history of collections, to comment current resources and to supplement unmanifested knowledge, and even to share their own life experience online. In the real space, the traditional way of exhibition no longer exists. Instead, it has an overlapped split-level inner structure. 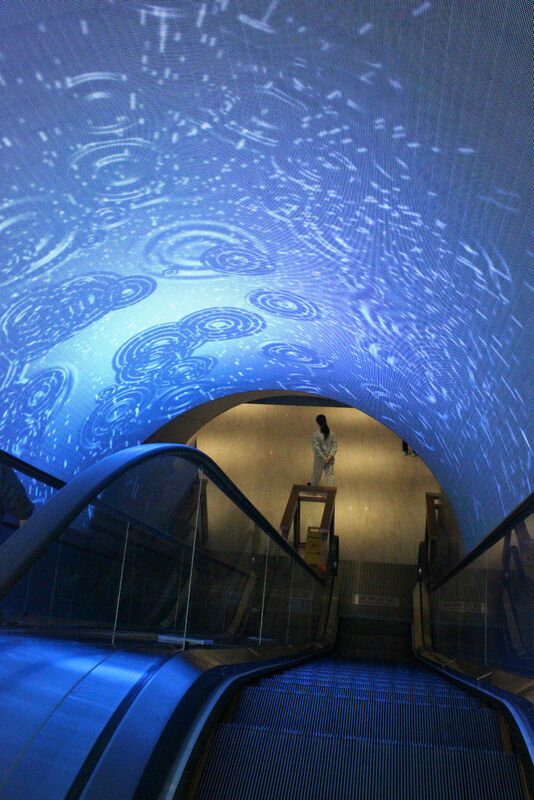 Putting to use a variety of digital technologies — such as Real-time photo and Mo-cap, it combines space, decoration and multimedia hardware with digital contents in order to create a three-dimensional exhibition environment and lead visitors to change steps along the movement patterns. In accordance with the exhibition topic — Civilization development of China, especially Jiangsu Province, there are six main exhibition area which displaying plenty of relics from primitive civilization to contemporary society. 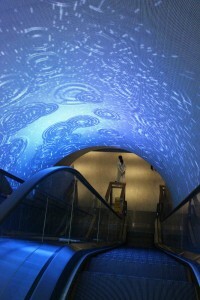 At the entrance of the digital gallery, there are some abstract symbols on the arc over the escalator. The space atmosphere of Old Times is created by the use of digital stream, clouds and stars. With the light projection on the ground and digital image on the wall, visitors can not only experience the burrowing life of primitive men, but also realize the courage of man’s conquests over nature. More particularly, we can change the displayed pictures and backgrounds sounds through virtual museum. In the second exhibition hall which called ‘Progress and Growth’, wrap-around walls looks like a serial scroll painting against the digital character projection. Audiences can also enjoy the very famous historical stories by means of digital projection imaging. ‘Expansion and Integration’, which displays wars and civilization expansion, using three-fold screen cinema to express signal contributions achieved by great historical figures and make a space-time extension come true. Except the use of DLP (Digital Light Processing) and giant screen images, particular interior spatial structure help present life and death, reshape history; and stimulate visitors a high degree of enthusiasm for participation. The development of history is not a straight line, but moves in circles with many twists and turns. From this point of view, the last exhibition unit of digital gallery has been divided into four fields — idea, nationality, technology and art respectively. Relics and history of social life scenes are reappeared through various digital windows on one hand; while on the other, visitors can ‘restore’ outworn relics or ‘paint’ on the surface of porcelains by the touch screen. After ‘blowing glaze kiln firing’, they can get a virtual earthenware with their names on it. Therefore, the exhibition contents can be constantly enriched and improved in the effect of human-computer interaction. Also, with the in-taking of collective intelligence, the atmosphere of ‘Eternity Begins with You’ can be showed up. As to the virtual museum, it restores collections and exhibition space of the entity by means of network and image-recognition technology. The virtual environment is so interesting that it makes us feel on the scene. We can get preferable visiting experience as well as comment and revise online, even upload and display our own works. Accordingly, the exhibition space has been amplified owing to the Mixed Reality; while visitors has been getting comprehensive information of collections under the influence of network navigation and interaction system. Powerful technical support is indispensable either for the digitized museum or virtual gallery. However, what we are pursuing is not the innovation of technology, but the accumulated resources and the universal applicability of technology. We can integrate an increasing number of resources because of the constantly updated technology; and then, resources conservation and information transmission will be more safe and convenient. In the digital gallery of Nanjing Museum, smart-phone has been widespread utilized. Once visitors entered into the gallery, they can use their own microphones to link to the official website of the museum to find out what collections they are interested in. Also, they can download the museum mobile APP to get a better visiting experience from the virtual museum, including interacting with historical events, reviewing the exhibits and talking to virtual historical figures. According to the powerful function of smart-phone, a variety of resources (characters, pictures, videos, voice and music, etc.) are integrated into an entire information system. In this way, visitors can get, keep and transmit exhibits information that they prefer. Besides, the museum APP are all available with IOS, Android and Windows Phone as well as tablets computers without any application software. Thus, traditional audio tour will be completely replaced in the effect of strong interest, interactivity and accuracy of smart-phone. Taking ‘Progress and Growth’ as an example, there is a dance video which performing a very famous historical story (Farewell My Concubine) in silhouette form behind the digital curtain wall. During the performance, visitors can use their phone to scan the two-dimensional code on the wall to express their own love comprehension and show them on the wall. Meanwhile, the lovers’ photos can be displayed on the wall through the phone APP. Not surprisingly, the exhibition on the mobile apps can be controlled by the visitors. It is no doubt that the digital technology makes museum exhibitions to be more intelligence owing to the collision and mingling of digital creativity and conventional methods. Moreover, the complementary relationship between site visit and online information transmission will be optimized. The digital exhibition of Nanjing Museum is quite good at sustaining innovations. But some of digital collections have not been perceived by visitors and still need a process of adaptation. Thereby, diversified services are provided to the public in order to meet individual requirements. As mentioned above, the two-dimensional code on the digital exhibition wall can be scanned to get detailed information of collections on smart-phones; and even to fully interact with relics. Visitors can look up different types of information in the virtual space and learn more about the old stories once they started taking an interest in a certain relic. For children, the museum provides them a variety of games, including miniature construction, gesture controlling, pottery firing and digital jigsaw puzzle. With these games, the curiosity of children will be satisfied and their learning enthusiasm can be constantly increased. 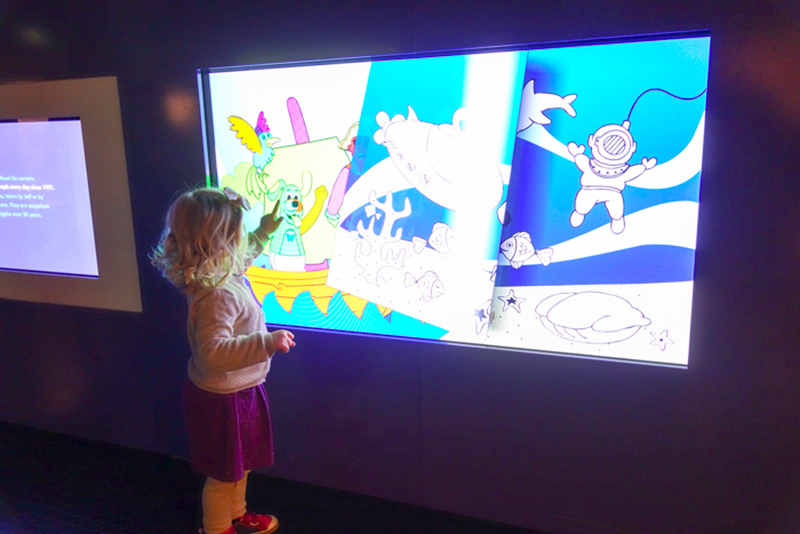 From this point of view, the digital museum has a special service function that deepening elementary education in order to provide the public probability of life-long study. Touch screen interaction √ Scientific education for youngsters. √ Providing historical and cultural resources for the public. Virtual imaging technology √ Virtual exhibition of science and technology. √ Virtual exhibition of history and culture. Audio capture √ To capture and record sounds of users when they are using some audio devices. √ The giant screen cinema. Lighting show √ To correspond with the exhibition theme and environment. √ To correspond with the exhibition theme and environment. Online games √ For kids. √ For people of all ages. Virtual museum × √ Time and space extension of real museum. It’s convenient to keep indoors to visit the museum. As a complement of traditional museum exhibition, the developing research and application of digital creativity provide more convenient visiting experience for the public. Over viewing of digital creativity of the two museums, both of them use advanced digital technologies and virtual reality to help visitors interact with exhibition space and collections to stimulate curiosities. First of all, contemporary digital exhibitions focus on inspiring interaction between visitors and collections with motivating visitors’ participant enthusiasm, pro-activity and interest. The use of intelligent digital technologies provides an opportunity for the public to feel all-around exhibits’ information through their sensory systems. In Nanjing Museum, the design, usage and manufacturing processes of relics during different periods of history can be perceived by the virtual reality system. Similarity, imaginative and interactive installations in Powerhouse Museum allowing visitors to have fun whilst learning about various aspects of nuclear science. Secondly, the outstanding entertaining and educational functions have always been the crucial part of digital creativity. For example, several masterpieces in Nanjing Museum are processed into digital dynamic paintings with interactive games. Audiences could be one of the story of a painting in the way of entertainment in order to be affected by historical sites, characters and stories. Such edutainment of digital exhibition, in a great extent, meet the physical and physiological need of people of all ages. Moreover, both of the two museums are quite good at using digital lighting technology mixing in the exhibition environment with the feature of practicability and function of decoration to highlight the information of collections. Last but not least, characteristics of human emotions are reflected by digital creativity. As is known to all, the aim of interactive digital exhibition is to mobilize human sensory factors and continuous changing its presentation according to the requirement of visitors in order to make them blending in with the museum exhibition environment. Therefore, focusing on from products oriented to people’s visiting experience, the digital creativity has developed a more significant emotional bond between visitors and exhibits. Also, it accords with the idea of contemporary digital museum exhibition. Certainly, there are several differences between the two museums’ digital exhibitions. The most prominent point is that the different interactive digital ways are affected by different cultural backgrounds. As one of the oldest technical museum, the Powerhouse Museum has collections of several hundred years, containing many achievements of Australia’s history, humanity, science and technology. Historical science and technology collections are displayed by means of modern digital technology to make the museum more and more ‘rational’; while audiences have curiosity to continue to explore emerging technologies. In contrast, the digital gallery of Nanjing Museum is more like a separate digital museum. Nanjing Museum is a place for collecting resources of passing human nature and history, especially Chinese traditional cultural art treasures. All of the exhibition information, including decoration, patterns and craft of relics, attached to each collection is very unapparent. Most of the collections are mainly about historical and cultural resources and there is little science and technology. In terms of digitized exhibition, historical relics are showed up in new ways to make visitors’ needs to be satisfied; while the modern digital technology and traditional culture form a good mutual complementary relationship. Another big difference is that the virtual museum is a crucial manifestation of Nanjing Museum. It transmits exhibits information to the public in two ways. The first one is to use bigger storage space and more convenient transmission way of the network to provide more detailed historical resources for researchers and professionals. The second one is to stimulate history in order to lead users to fit in historical process and perceive the old days; while setting up a special history which survive in the cyberspace. Thus, without the limitation of time and space,it has expanded and extended the exhibition of real museum; and has developed to socialized open source platform. There is a big distinction between TOUR and USE. In Chinese, ‘参观’ (cān guān) equals to TOUR. ‘参’ stands for comparison; while ‘观’ means look at something. So ‘参观’ implies that we look at something contrastively on the spot. As the name indicates, during the process of tour in museums, we only use our visual organ to hunt for the exhibits information. Some special collections in museums can not be touched because of their historical uniqueness. Visitors are separated from collections by showcases so that they could only understand collections from the text description nearby. But is it real accurate information what we have read? In the Powerhouse Museum and Nanjing Museum, the use of digital creativity has re-processed the basic resources of collections to form new exhibits information out of material objects. The new information about the images, sound and videos is provided to the public to USE in different manifestations. During the process of USE, we can not only have a look at collections, but also touch, listen and smell them. Our mind will deal with the information we have perceived through our sense organs; and then we can get our own perspective or conclusions. This is the action of using museums. In this way, we can be impressed with the exhibition and remember what we have appreciated rather than ‘set and forget’. In museums, most visitors and staff are motivated to seek information.The easier it is to find, organize and connect the information being sought to information people already have, the more visitors and staff will engage with each other and the museum content. This illustrates the importance of mental models, which are representations people have in their mind of the things or places with which they are going to interact (Farzan, 2014). Today, one of the most widely-used applications to deliver interactives is a Web browser due in large part to its ability to support Flash which provides full motion video, animation, and interactivity using a powerful embedded scripting language called ActionScript (Nik and Paul, 2009). Users often come into contact with a digital object first through a search engine, arriving without any contextual knowledge of the collection in which it is contained or the repository that holds it. Providing these users with context and user-friendly interfaces is a challenge that cultural heritage institutions can either choose to avoid or approach as an opportunity to create new ways of interacting with and using their digital collections (Laura, 2015). Our goal for the research was to investigate systematically how enhancement of digital creativity using advanced technologies in museums might lead to an improvement in interaction between visitors and collections. We also wanted to find out the junction of cross-cultural digital creativity for museum exhibitions, given the underlying typical historical and cultural heritages. Although the time on task is limited and we found not much significant difference between the Powerhouse Museum and Nanjing Museum, the fact that the digital creativity analysis did, on average, have significant effect on and generate long-term value for the future research work. Museums, particularly art museums that have contemporary culture as part of their collecting mission, or those that are dedicated to understanding contemporary events, such as science centers, face a special challenge since they not only need to use digital methods to provide the public with access to their collections, but also are challenged to collect and exhibit digital works (David and Jennifer, 2009). In order to stay current and useful, digital collections should continue growing and changing as new technology develops and institutions’ abilities and priorities shift. Each new step and new upgrade builds a solid foundation for the next step and even greater improvements in the future (Laura, 2015). In 2008, IBM kicked off its Smarter Planet initiative, which focused on improving how the world works. One of the primary behind its concept is a web of sensors all over the planet, leading to a data explosion. From this purpose, the more digitized and intelligent museum exhibitions are now receiving increasing attention. The potential for all-around digital exhibits information gain will be increased if digital creativity can be used to sustain or deepen engagement with collections. The interaction with all of digital collections is intended to have a cumulative impact on understanding. With the reference of this cross-cultural digital creativity research, we hope that digital creativity could help exhibits information transmission be more transparent on the basis of understanding history and culture of different nations in the near future. 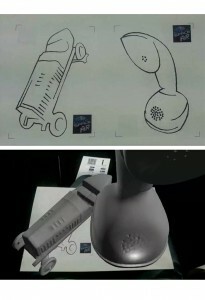 Based on the interactive perception, more intelligent digital exhibition system could be established to create new value. Additionally, museums also have been attracted by the engaging power of serious games, especially as a means of attracting and keeping the attention of younger audiences and people who might be alienated by more traditional methods of teaching (David and Jennifer, 2009). In a sense, digital creativity for interactive games in museums will promote social accumulation of collection resources, and even may help set up a huge knowledge database across the globe. We believe that the digital interactive museum games have impacted our abilities to hold greater edutainment effect and have inspired designers and curators for generations. Considered in this context, the research findings point to a belief that digital creativity in museum exhibitions help visitors get sense of identity and pride of national culture through experience and reflection rather than to remember advanced digital technology. Therefore, in the future research work, we will focus on investigating how digital creativity are best adapted to national feature in museum environments. Alex Byrne. (2009). “Australia: Libraries, Archives and Museums.” In Marcia J. Bates and Mary Niles Maack (ed.). Encyclopedia of Library and Information Sciences. Boca Raton: CRC Press, 392-407. David Bearman & Jennifer Trant. (2009). “Museum Web Sites and Digital Collections.” In Marcia J. Bates and Mary Niles Maack (ed.). Encyclopedia of Library and Information Sciences. Boca Raton: CRC Press, 3762-3772. Farzan Baradaran Rahimi. (2014). “A model for sociocutural interactions in museums.” Museum Management and Curatorship 29, 174-187. Laura Deal. (2015). “Visualizing Digital Collections.” Technical Services Quarterly 32, 14-34. Monica Calcagno & Claudio Biscaro. (2014). “Designing the Interactions in the Museum.” International Studies of Management & Organization 42, 43-56. Nik Honeysett. (2009). “Interactive Multimedia in Museums.” In Marcia J. Bates and Mary Niles Maack (ed.). Encyclopedia of Library and Information Sciences. Boca Raton: CRC Press, 2837-2846.
. "Towards comparative methods for evaluating cross-cultural digital creativity in museum exhibitions." MWA2015: Museums and the Web Asia 2015. Published August 9, 2015. Consulted .